Kawato, M., Furukawa, K., Suzuki, R. (1987): A hierarchical neural-network model for control and learning of voluntary movement, Biological Cybernetics, Vol.57, pp.169-185. Kawato, M., Gomi, H. (1992): A computational model of four regions of the cerebellum based on feedback-error-learning, Biological Cybernetics, Vol.68, pp.95-103. Kawato, M., Hayakawa, H., Inui, T. (1993): A forward-inverse optics model of reciprocal connections between visual cortical areas, Network:Computation in Neural systems, Vol.4, pp.415-422. Wolpert, D., Kawato, M. (1998): Multiple paired forward and inverse models for motor control, Neural Networks, Vol.11, pp.1317-1329. Atkeson, CG., Hale, J., Pollick, F., Riley, M., Kotosaka, S., Schaal, S., Shibata, T., Tevatia, G., Vijayakumar, S., Ude, A., Kawato, M. (2000): Using humanoid robots to study human behavior, IEEE Intelligent Systems: Special Issue on Humanoid Robotics, Vol.15, pp.46-56. Morimoto, J., Kawato, M. (2015): Creating the brain and interacting with the brain: an integrated approach to understanding the brain, Journal of the Royal Society Interface, Vol.12, 20141250. Shidara, M., Kawano, K., Gomi, H., Kawato, M. (1993): Inverse-dynamics model eye movement control by purkinje cells in the cerebellum, Nature, Vol.365, pp.50-52. Kawato, M. (1999): Internal models for motor control and trajectory planning, Current Opinion in Neurobiology, Vol.9, pp.718-727. Gomi, H., Kawato, M. (1996): Equilibrium-point control hypothesis examined by measured arm-stiffness during multijoint movement, Science, Vol.272, pp.117-120. Burdet, E., Osu, R., Franklin, D., Milner, T., Kawato, M. (2001): The central nervous system stabilizes unstable dynamics by learning optimal impedance, Nature, Vol.414, pp.446-449. Imamizu, H., Miyauchi, S., Tamada, T., Sasaki, Y., Takino, R., Puetz, B., Yoshioka, T., Kawato, M. (2000): Human cerebellar activity reflecting an acquired internal model of a new tool, Nature, Vol.403, pp.192-195. 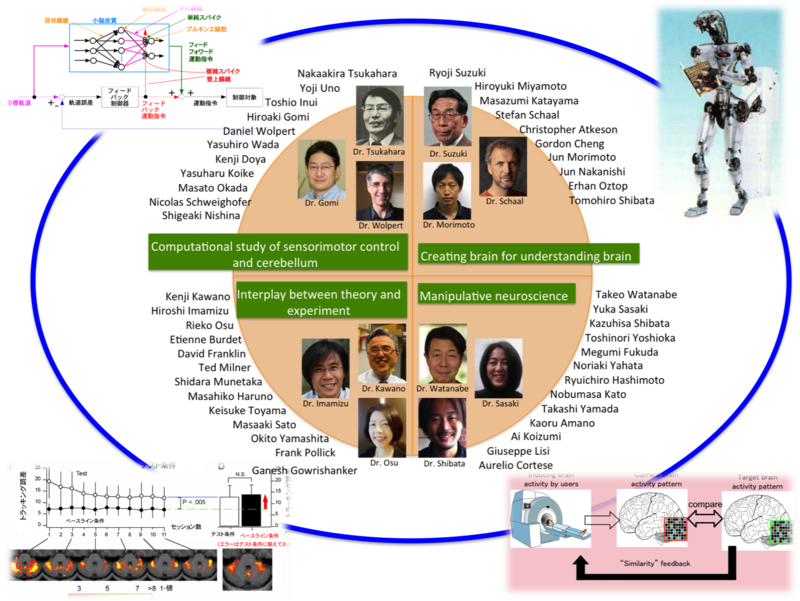 Haruno, M., Kuroda, T., Doya, K., Toyama, K., Kimura, M., Samejima, K., Imamizu, H., Kawato, M. (2004): A neural correlate of reward-based behavioral learning in caudate nucleus: a functional magnetic resonance imaging study of a stochastic decision task, Journal of Neuroscience, Vol.24, pp.1660-1665. Haruno, M., Kawato, M. (2006): Different neural correlates of reward expectation and reward expectation error in the putamen and caudate nucleus during stimulus-action-reward association learning, Journal of Neurophysiology, Vol.95, pp.948-959. Yahata, N., Morimoto, J., Hashimoto, R., Lisi, G., Shibata, K., Kawakubo, Y., Kuwabara, H., Kuroda, M., Yamada, T., Megumi, F., Imamizu, H., Nanez, JE., Takahashi, H., Okamoto, Y., Kasai, K., Kato, N., Sasaki, Y., Watanabe, T., Kawato, M. (2016): A small number of abnormal brain connections predicts adult autism spectrum disorder, Nature Communications, Vol.7, p.11254. Megumi, F., Yamashita, A., Kawato, M., Imamizu, H. (2015): Functional MRI neurofeedback training on connectivity between two regions induces long-lasting changes in intrinsic functional network, Frontiers in Human Neuroscience, Vol.9, p.160.